Reading an article by Stephen Knudsen in April-May’s edition of Professional Magazine entitled ”To see a Work of Art” made me think back to a recent experience I had in Portugal. Knudsen’s article was about spending a day at the Los Angeles Museum of Art to see sculptor Michael Heizer’s LevitatedMass. 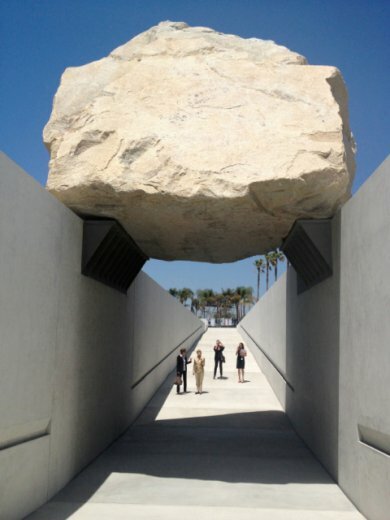 Michael Heizer, Levitated Mass, 2012, diorite granite and concrete, height: 35 ft., 7 in. ; width: 21 ft., 8 in. ; length: 456 ft.; granite weight: 340 tons © Michael Heizer. Steve Knudsen first explained about the controversy surrounding the granite boulder’s final installation at the Museum in 2012 after Heizer first sketched out the idea back in 1969.Then Knudsen described the rewards of sitting watching this enormous boulder suspended over a ramp, ranging from the reactions of fellow visitors of all ages to the final crescendo at sunset of the boulder seeming to rise as the sun sank. He comments that “the seemingly grand narrative of moving the rock was, in the end, just a blip in the bigger story that points to sublime space, celestial movement and geologic time” (my thanks to him for this quote). 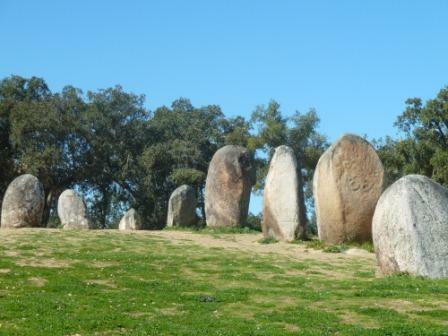 His remarks took me straight back to my amazing hours in early March at the Cromlech dos Almendres, near Evora in Portugal. 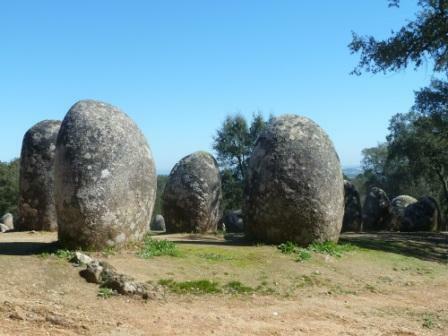 One of the most important megalithic complexes in Europe, it is sited on a gentle hillside, overlooking rolling hills towards Evora, amidst olives and cork oaks. Daring from the 6th millenium BC, this extraordinarily grandiose ensemble of roughly one hundred boulders takes one's breath away as you approach the wide-flung site. Just as Michael Heizer must have thought long and hard about his boulder, its shape, its material, its potential home and how it would best be viewed there, its messages and meaning to anyone viewing it – even how to transport it to the site, so too, our ancestors must have spent much time planning the Cromlech dos Almendres. Like Heizer’s boulder, the huge megalith boulders are granite. Wonderful shapes, some of these monoliths have some carving on them, now well worn, but still hugely evocative as the sun moves and catches different angles and shapes on their surfaces. Apparently these boulders were placed at different times, in concentric circles and later ellipses, all on a southeast-northwest axis. The entire group occupies an area of about 70 by 40 meters. 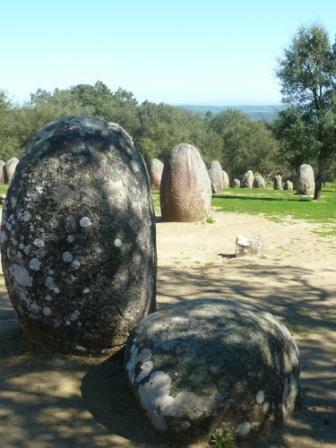 Many of these massive stones are three meters high, while others, of earlier date, are slightly smaller. Just to transport them to this hillside must have required incredible effort and organization, let along to site them and erect them into a vertical position. The endeavour speaks of enormous religious and social fervor, amongst groups of people who were few in number to start with. Connections with the land, their gods perhaps, their social structures – this was a huge undertaking to assemble these wonderfully powerful and eloquent boulders. 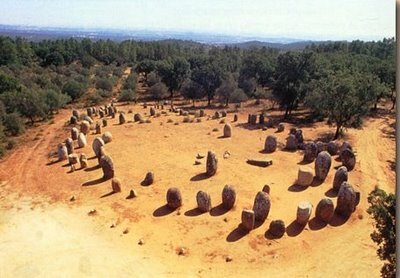 Perhaps too the ensemble of monoliths was used for astronomical purposes. Whether artistic considerations came into their choices of the stones to transport and place – who knows. But the carvings, whatever their significance, are beautiful too, and the carvers must have been conscious of that aspect. Many of the stones are flatter on one face, perhaps shaped deliberately. Each boulder speaks, as the sun moves around it and it relates to the next boulder and then the one beyond. The tactile qualities of the granite, so enduring, so interesting as the lichens hint at the northern side of the boulder, are memorable. 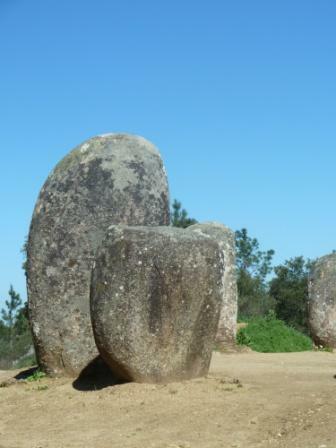 Like Stephen Knudsen’s perceptions of Levitated Mass at LACMA, the impressions that the Cromlech dos Almendres leave with one are of grandiose endeavours. Eight thousand years ago, men and women believed deeply enough in matters beyond their daily needs, in matters that transcended space, time and the span of human life, to expend enormous physical effort to create a sacred place of power and great beauty, sited exquisitely, laid out with care and sensitivity for the natural flow of life. Even in our complex technology-driven 21st century, a visitor to the Cromlech is awed and inspired by the powerful voices that speak to us from the past of older, deeper, more important matters.